HARRISBURG – Rep. Karen Boback (R-Lackawanna/Luzerne/Wyoming) will be holding her 10th annual Veterans Appreciation Event and Expo Saturday, Nov. 5, in conjunction with Misericordia University. The expo will take place from 9 a.m. to noon in Misericordia University’s Insalaco Hall. A Veterans Recognition Breakfast, open to any veteran of the 117th District, will be held in Insalaco Hall at 9 a.m. The breakfast is being held in conjunction with Metz Culinary Management. Veterans may be accompanied by their spouse (or one guest) to the breakfast at no charge. The breakfast will be followed by a special recognition program, held in the Lemmond Theater, to honor our veterans. The deadline to register for the Veterans Breakfast is Thursday, Oct. 27. To RSVP to for the breakfast, call Boback’s offices at (570) 675-6000 or (570) 836-4777. Residents can also call toll-free at (800) 278-3939 or register online by visiting RepBoback.com. This year, in honor of the 10th anniversary of this event, a commemorative booklet of local veteran photos and service-related memories will be provided. Veterans are welcome to share a photo or memory from their time in the service. To contribute a photo or memory to the booklet, stop by one of Boback’s district offices. Attendees will be able to visit the expo between 9 a.m. and noon, where a variety of federal, state and local agencies that offer services to veterans will be on hand to answer questions throughout the entire event. The expo and program are open to all residents of the 117th Legislative District. “My veterans program has evolved over the past ten years, from a formal celebration, to a breakfast, ceremony and expo. The event is in response to the needs and requests made by our veterans. I am proud to sponsor this Veterans Appreciation Event and Expo along with Metz Culinary Management and Misericordia University. I encourage all veterans in the 117th District to attend,” said Boback. In conjunction with the event, Boback’s office is holding a Veterans Art/Essay Contest, which is open to fifth-grade students in the 117th Legislative District. This includes students in the Lake Lehman, Dallas, Tunkhannock, Northwest and Lackawanna Trail school districts. Students must choose either to submit a drawing or an essay. A maximum of one entry from each student will be accepted. Entries must be received by Oct. 12, and will be judged by Boback’s Veterans Advisory Committee. The students who create a top three drawing or essay will have their work published in the 10th Anniversary Memory Booklet, and will be recognized during the event. For more specific rules and more, visit RepBoback.com. 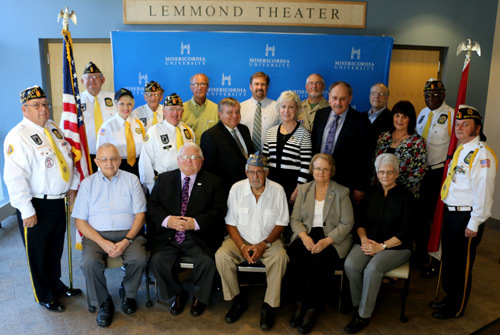 Rep. Karen Boback (R-Lackawanna/Luzerne/Wyoming) is pictured with her Veterans Advisory Committee. Seated from left are John Headley; Art Peoples, Dallas Rotary; Sam Greenberg, Jewish War Veterans; Sandy Peoples, Dallas Rotary; and Darlene Headley. Standing, second row, are John Emil Sr., Dallas American Legion; Sharon Austin, Harvey’s Lake American Legion; Liam Lewis, Dallas American Legion; Thomas J. Botzman, president, Misericordia University; Boback; John Metz Sr., executive chairman, Metz Culinary Management and Misericordia University trustee; Mary Metz; and Charles Fleming, Dallas America Legion. Standing in the third row are Ned Podehl, Dallas American Legion; Jim Baloga, Dallas American Legion; Max Benjamin, Northeastern PA Veterans Multi-Care Alliance; Glenn Bozinski, director of Admissions, Misericordia University; Peter Calkins, Boy Scout Troop 281, Dallas, and project manager, Misericordia University; Scott B. Schuster; and George Tucker, Dallas American Legion.